This is the inflatable Rudolph that stands nearly two stories tall. The inflatables underbelly is 9 1/3' above ground at its highest point, inviting carolers and visitors to walk beneath. Rudolph stands 15' tall and bears a familiar, friendly expression with his LED-illuminated bulbous red nose, large eyes, smiling mouth, and twin young antlers. Rudolphs head is cocked slightly, implying his natural curiosity, while his pert tail and ears suggest an alertness and eagerness to entertain. An integrated air pump inflates the display in four minutes (providing constant inflation) while lights in the neck, body, and tail evoke merriment. Made of durable tear-resistant polyester that withstands years of setup and storage, Rudolph remains in place with included stakes and 19 2/3'-long tethers. Folds to 18 1/4" x 15" for convenient storage. Plugs into AC with 5' cord. 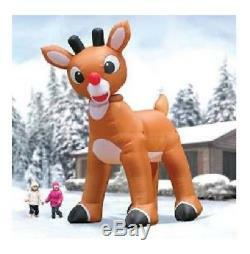 15' H x 6 3/4' W x 13 1/3' L. The item "15 Ft Rudolph Red Nose Reindeer Santa Airblown Inflatable Christmas Yard Decor" is in sale since Thursday, October 18, 2018. This item is in the category "Home & Garden\Holiday & Seasonal Décor\Christmas & Winter\Yard Décor". The seller is "epdecor" and is located in Saint Petersburg, Florida. This item can be shipped to United States.